About a year ago, Siborg Systems Inc. started working with the Institute of Automation and Electrometry of the Russian Academy of Sciences to create a calibration fixture that would be compatible with all models of the Smart Tweezers LCR-meters, including the recent LCR-Reader. When completed, the fixture was sent to Navair Technologies, one of Canada’s top calibration houses for verification of accuracy. With the fixture being verified, Siborg would be able to calibrate all models, but most importantly could now offer certificates of calibration traceable to NIST for the LCR-Reader. Earlier models of Smart Tweezers, ST1, ST2 and STIC, used a 2-wire connection to the handles and gold-plated test leads. 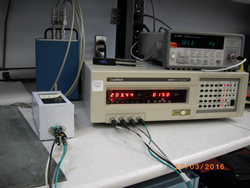 Unfortunately the 2-wire version of the calibration fixture could not handle the whole dynamic range of L-C-R values, namely lower values of capacitance and inductance and higher values of resistance. 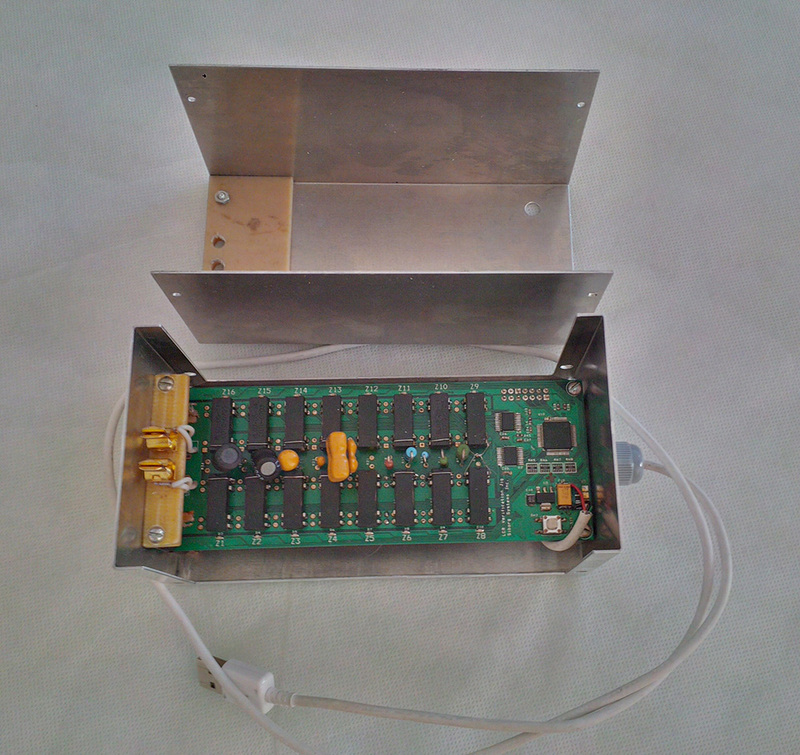 This is due to the parasitic capacitance and resistance of the calibration fixture circuit board. Therefore the 2-wire version of the calibration fixture was acceptable for calibration in mid-range values but for all available models of Smart Tweezers. In order to improve the accuracy and increase the calibration range Siborg and their partners in Novosibirsk decided to implement a 4-wire version of the calibration fixture. This fixture should be much less sensitive to the parasitics on the fixture PCB and therefore would allow measuring lower capacitance and inductance values and higher resistance values. The created calibration fixture uses a set of 14 known components of different types that are within the Smart Tweezers’ measurement ranges. The current fixture is using a 4-wire connection, instead of a 2-wire connection to the device that was previously used; the new fixture is able to adequately calibrate only models ST5 and higher of Smart Tweezers. When a device is connected to the fixture, the fixture connects to a different component with a push of the control button. 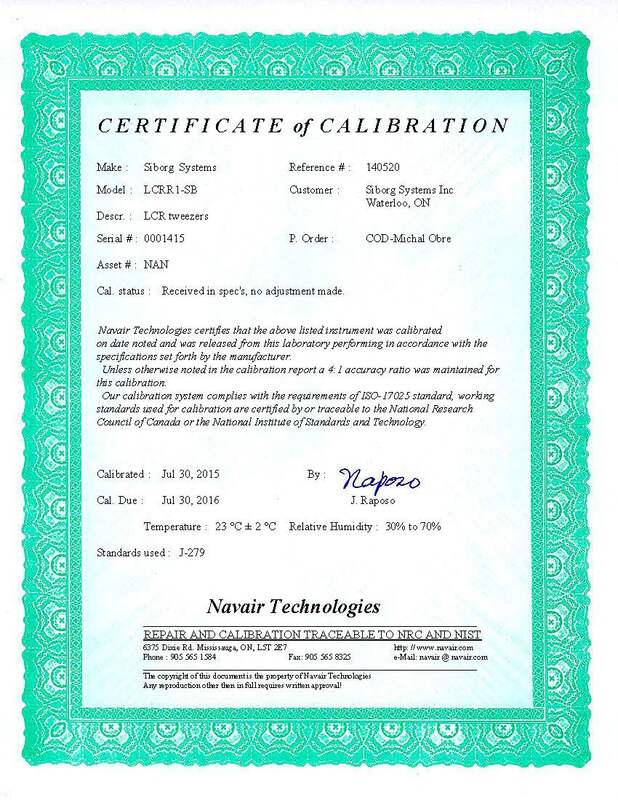 The measurement values are displayed on the calibrated device. These values are then compared to the known values of the components allowing to accept or reject the calibrated device. LCR-Reader and Smart Tweezers were introduced in the early 2000’s and have gained world-wide recognition for their unique design that combines a set of gold-plated tweezers with a lightweight LCR-meter. 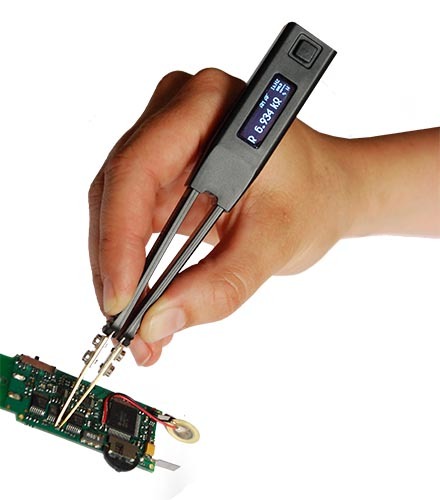 Operated with just one hand, Smart Tweezers and LCR-Reader are able to determine the type of component and measure accordingly by grasping a component between the tweezers. The Smart Tweezers line has become synonymous with quick measurements while not compromising accuracy of testing and troubleshooting Surface Mount Technology. There are two versions currently available; the ST-5S, a higher-end device with extensive menus and features with a basic accuracy of 0.2% and the LCR-Reader, a lower-cost device that offers the same basic functionality as the Smart Tweezers LCR-meters. The LCR-Reader has fewer features, including extensive menus and options such as an offset subtraction, component sorting, and continuity and diode test, but offers the same easy one-handed operation and high basic accuracy at about half the price. It was previously believed that the LCR-Reader had about 1% basic accuracy, but after sending 4 randomly selected devices to Navair, the results showed that the basic accuracy was closer to 0.5%. Some deterrents of the LCR-Reader are companies and professionals that require their measurement tools to be calibrated annually in order to remain ISO compliant. With the release of the new verification fixture, the ability to create NIST Traceable calibration certificates becomes possible. Besides, with the new calibration fixtures from Siborg Systems Inc., all Smart Tweezers LCR-meters and most importantly the LCR-Reader, can be calibrated annually, making them even more attractive to companies that work with Surface Mount Technology. Smart Tweezers LCR-meter is an indispensable tool for all applications from manufacturing to repair and maintenance. Their quick measurements are especially helpful on time-sensitive projects and assembly lines. For all the latest news, visit the Smart Tweezers Blog and the Smart Tweezers Blog. See the new LCR-Reader store for all the products available. Established in 1994, Siborg Systems Inc. is a source of engineering hardware and software tools for the semiconductor and electronics industry. Located in the city of Waterloo, Ontario, Canada, they enjoy being a part of the local world-renowned high-tech community.